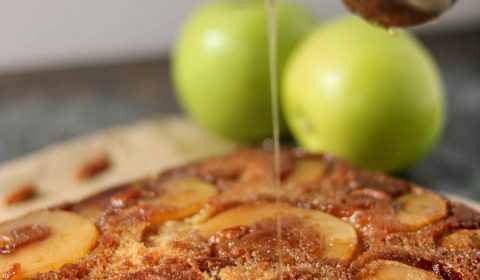 Before we dive into this delicious apple upside down cake, I want to first throw out a couple disclaimers: this recipe is not gluten-free, refined sugar-free, or nut-free and this is not my original recipe. I came across this recipe in an old edition of Taste of Home, circa 1996. I decided to fix as is rather than adjust to a different version. While many recipes originate somewhere, I wanted to make sure I’m fully transparent on this one. Why? Well, let me break down my reasoning. As for gluten-free, when it comes to baking sometimes I forego gluten-free for simplicity sake. I do not have an official Celiac diagnosis, I only know that when I consume gluten, bad things usually happen. However, sometimes I subject myself to those consequences. In this case, I went with traditional, all-purpose flour. But you have a nut allergy? Correct, I have a severe nut allergy that requires me to carry around an epi-pen at all times. However, for some odd reason (and maybe I’m gambling here) but pecans do not trigger a reaction like all other nuts. Strange, I know. As for sugar, well sometimes you just go with it, you know? But I digress….time for this deliciousness! Traditional upside down cakes are pineapple, but I’m not a huge pineapple fan. 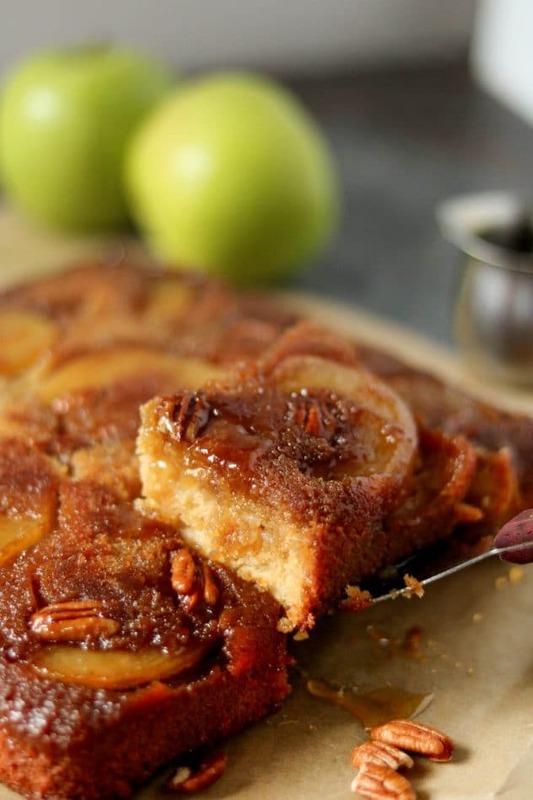 So when I discovered this apple upside down cake I thought oh man I’ve got to try this one! It did not disappoint. If you’re not a huge pineapple fan but still want the moist cake served up with most upside down cakes, you’ll want to try this one. Top with drizzled raw honey for some additional sweetness and you have near perfection. As you can see, the brown sugar caramelizes on the bottom, adding a caramelized texture to the pecans. Then drizzle on additional honey and you have one super moist bite! The apple rings also cook down to a nice soft texture. I could go on and on about this cake, but how about instead I just get you the recipe, pronto! Download our FREE ebook; Top 10 Most Saved Recipes of 2017! 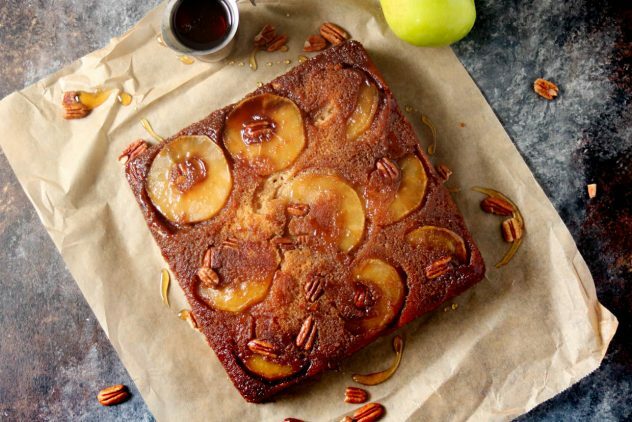 A great autumn variation to a traditional upside down cake. In a medium sized bowl, whisk together the milk, honey, and vanilla. Peel, core, and slice apples into 1/4 in. rings. In a 9×9 baking pan, add 1/4 cup of the butter and place into the oven to melt. Add in 1/2 cup of the brown sugar and stir to combine. 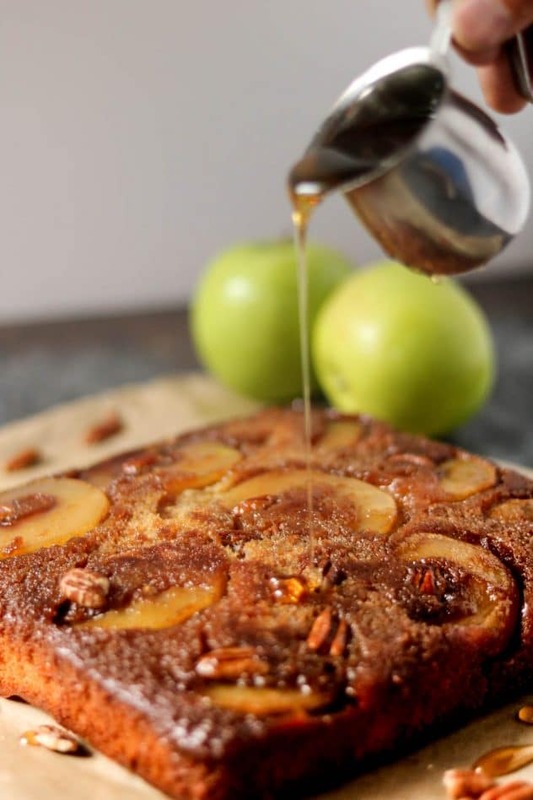 Place apple slices (single layer) and pecans onto the pan, on top of the sugar mixture, covering the entire bottom of the pan. In a large mixing bowl, add the remaining 1/4 cup softened butter and remaining 1/2 cup brown sugar and beat with a mixer until light and fluffy. Add in eggs, beat for another minute. While the mixer is running on low, gradually add in portions of the milk mixture alternatively with the flour mixture. Keep alternating until all is added and well-combined. Pour batter over apple slices and spread carefully to fill the pan. Bake 45-50 minutes or until a knife or toothpick comes out clean from the center. Cool on a rack for 5 minutes. Then, carefully loosen the sides, place a cake plate or pan on top and invert. Drizzle with additional honey and pecans.